Receipt — a top-level record with shopping list name, date and time of purchase, total amount and total number of items. History items — each record corresponds to an item checked out from shopping list. All history — all history items. Recent items — history items from the past 30 days. Top items — history items from the past 30 days which were purchased 3 and more times. Make sure that the list you want to populate is selected on top of the screen. Scroll and expand the receipt with history items you would like to reuse. Tap history items to add them to the shopping list. A checkbox next to an item indicates that item is on the shopping list. In case you would like to add all items from a receipt, long-tap the receipt and choose Add to list option. All items from selected receipt will be instantly added to the current shopping list. To modify a receipt record, tap on the right side of a row to bring up the Receipt details. This screen allows changing receipt title, purchase date and time. Purchase summary is also available for review. To delete a receipt record, long-tap the record under History tab and choose Delete from popup menu. Similarly, you can modify and delete history items. Tap on the right side of a row to open Edit history item screen which allows changing record fields. Or long-tap a row and choose Delete to delete history item. Receipt total will be automatically recalculated if history item is changed or deleted. If you need to delete all history, click phone’s Menu button and choose Delete all. App is useful and easy to use. Thanks for supporting it. I was experimenting with History and managed to delete All History. I learned that Undo restored the lost All History. Can you explain how All History works. Also, how deep is Undo, does it use lots of memory, and can it be purged? Thanks. Michael, All History is a list of all items ever checked out. We are going to remove that option in the next update of Mighty Grocery. As for Undo, it keeps a few steps back and balances it with consumed memory. In other words, with smaller changes you have more steps which can be rolled back. No way to purge Undo yet. Just purchased full version and I thought I looked everywhere and don’t see the word receipt next to history or under any other tabs. I assume it is somewhere but unable to locate. 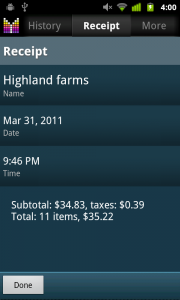 Can I enter the total spent on groceries in past and track this after the fact? Like in a spreadsheet by date, store, and dollar amount? The description seemed to describe such a feature, but I am unable to locate this. Is there any easy way to enter sku from past receipts of items purchased on desktop and have sync to phone? It is much easier to type on a keyboard than enter items onto the phone pad. Basically, a windows version of your software that will allow me to enter data base easier. 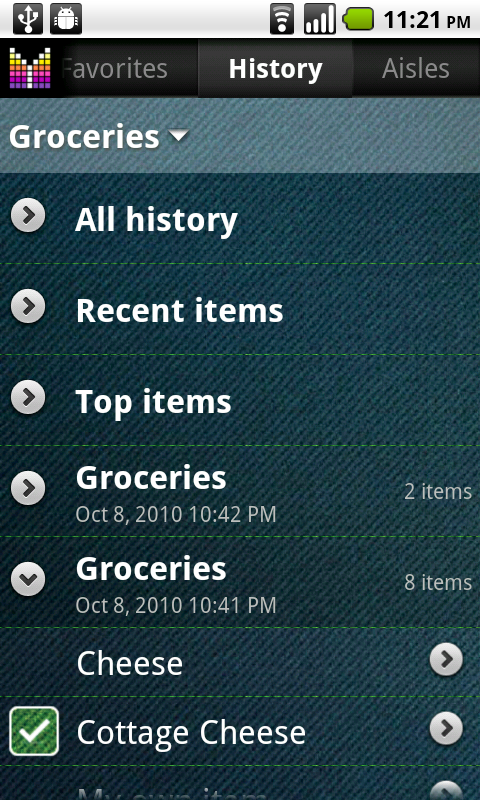 Ray, kindly note that History tab in Mighty Grocery allows you to track all checkouts from your shopping lists. I.e. 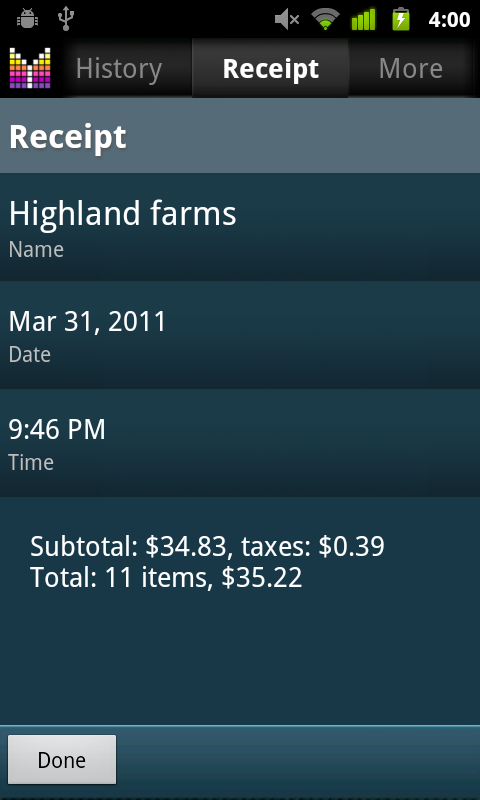 every time you tap “Checkout” in shopping list all checked items will be moved to History with prices, qty, etc. Unfortunately, the app does not provide analytics as to your spendings yet. We may consider this feature going forward. Also, we are working on adding more features to the web version to make it easier to make changes with your account. If you find Mighty Grocery does not fit your needs feel free to ask for refund at hi@mightypocket.com. Is there a way to export the History? Simple formats like CSV or TXT would be fine. I’m looking to import in to Excel or Quicken. Thanks. DK, thanks for your question. Unfortunately, no. However we plan this feature going forward. Haik, kindly note that all items from History should automatically appear in Pick list unless “Automatic picks” option is OFF (Menu > Settings > Options > Advanced). You can try the Search function (More > Search) to locate your items in Pick list. If the items are still missing from Pick list, go to Menu > Settings > Pick list > tap Side menu button (upper-right side) > Add existing products from history. Please let me know if you have any further questions or comments. Is there a way to keep track of the history items without all the duplications? It’s taking up too much Internal memory on my Kindle. Do they have to be deleted one at a time? Valerie, thanks for your questions. If you don’t want to keep History, you can delete all history items under History tab –> Menu –> Delete all. Or you can long-tap a receipt and choose “Delete”. Please make sure to keep your Automatically create items in Pick list. Just go to Menu –> Settings –> Pick list –> Automatic picks –> Side menu button (upper right corner) –> Select all –> Actions –> Move to My picks. Please let me know if you need any further assistance. i like your app very much, but i have one problem tha bugs the hell out of me. recognize them, so i have to config the item all over again (asile, quantity, that kind of config). can you help me with that? Hi Ahikam, thanks for your feedback and I will be glad to help you. Could you please advise how exactly do you add items to your shopping list? Are you using Favorites, Pick list, History or search under the List tab? Really enjoying this app. Only prob is as a single guy I do alot of short trips for different things and the lists in history are piling up. If I delete the receipt history I seem to lose all the prices I put in. Can I avoid this? Thomas, thanks for your feedback and your question. 1. Go to Menu –> Settings –> Pick list –> Automatic picks. 2. Select items you want to keep or Long-tap any row –> Select All. 3. Tap Actions –> Move to My picks. 4. Now it’s safe to clear history. All items under My picks will be kept intact. I want to save my most used items for the prices I’ve listed. but I need to delete all the duplicated items. taking up too much space! I’m not seeing this “tap actions & move to my picks” action you talk about under the pick list section? Help please!! First of, please make sure your are using the latest version of Mighty Grocery which is v.2.7. Second, in the latest version Auto-pick products will remain on Pick list even if you delete “anchor” items from History or shopping lists. So you can safely remove records from History. – Side menu > Move to My picks. Hi! 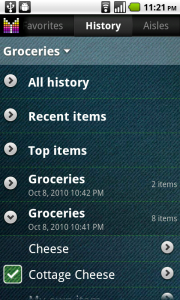 Your app is perfect for a couple, when shopping list synchronizes, but does history synchronizes too? Hi Andrey, thank you so much for your feedback and your question. Unfortunately, there is no way to sync history yet, however you may want to consider creating backup on your “primary” phone and restore backup on your “secondary” phone from time to time to transfer history. Thanks and I look forward to hearing from you again. Hi, I like the app so far, still just getting know it. I would like to know if there is a way to “select all” from history to move items back to the list without having to select and add each item individually. This would be helpful for shopping lists which I reuse regularly. Hi ali, thank you for your question. Yes, there is an option to add all items. Just long-press a receipt (grouping record) and choose Add to list command. Looking forward to hearing from you again. Yes, I see it now. Thank you!